BACKGROUND: Duration of rehabilitation is an important rehabilitation clinical outcome both from a clinical and administrative point of view. Very few studies have looked at predictors oftreatment duration in out-patient rehabilitation setting especially in patients with orthopedic-traumatologic conditions. AIM: We undertook a prospective study to assess treatment duration and identify variables predicting this outcome measure (primary outcome) and efficiency in range of motion and activities of daily living (secondary outcome). DESIGN: Prospective and observational study. SETTING: Out-patient Service for Rehabilitation. POPULATION: Two hundred and ten patients admitted to Out-patient Service for Rehabilitation of orthopedic disorders were enrolled: 94 patients had limb fracture (35 wrist fracture, 28 ankle fracture, 27 shoulder fracture), and 120 and undergone elective orthopedic surgery (27 cruciate reconstruction, 93 rotator cuff repair). METHODS: Univariate Regression analysis was applied to analyze relationships among variables and length of rehabilitation while backward stepwise regression analysis was used to predict treatment duration. The independent variables were age, gender, work, type of physical therapy, comorbidity, pain, onset to admission interval, initial disability, initial range of motion percentage (ROM), and diagnosis group. RESULTS: Mean treatment duration was 29.7±15 days. Treatment duration following rotator cuff repair was significantly longer than that of cruciate reconstruction (P=0.005), wrist fracture (P<0.001), and ankle fracture (P=0.002). Treatment duration was related to working status, admission disability, onset to admission interval, diagnosis group, admission pain, and admission range of motion. In multivariate regression analysis, admission range of motion and onset to admission interval were the only independent predictors of treatment duration and efficiency in range of motion, while admission range of motion and admission Health Assessment Questionnaire were predictors of efficiency in Health Assessment Questionnaire score. CONCLUSION: The study highlights that rehabilitative treatment duration has strong relationship with admission range of motion and onset admission interval. 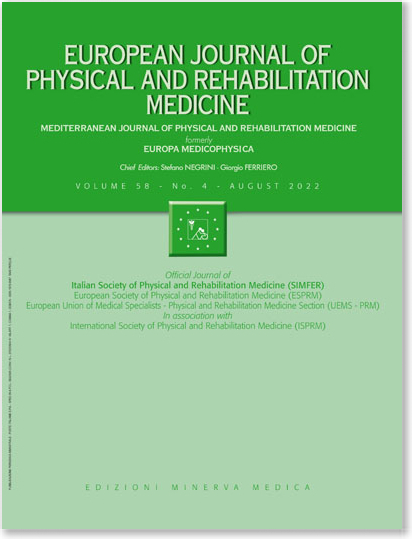 CLINICAL REHABILITATION IMPACT: These findings should be useful for physicians for planning therapeutic measures in patients with orthopedic-traumatologic conditions and for managing the usual activities of an Out-patient Rehabilitative Service.